Yesterday, I took three of our guests out on a 4-hour adventure, and was SUPER PLEASED to see the first puffins of the year. For those of you that are not familiar – the puffin comes in two varieties around there: the tufted puffin, and the horned puffin. The tufted version is our most common, and the earliest to arrive. They migrate out of here in the late summer, and they come back in the early summer to nest. Last year they didn’t arrive until almost mid-June, so I was pleased to see 8 of them yesterday. Kate and Randy were busy clicking away with their cameras, and as I got them very close to these fascinating birds, I trust they got some very good pictures. Many of you know that I used to be heavily into photography, but since I have “the shakes” so badly, and can’t seem to get a decent, sharp photo unless I get on a tripod – I rely heavily on my guests to send me their best pictures, and usually it works out well. Kate promises to email her best photos from yesterday’s trip – after she finishes her trip to Denali, where she and her parents are headed next. Many a picture was taken yesterday as we met some very cooperative sea otters and bald eagles, and one mountain goat that was down low enough to photograph. We are still waiting for the whales to show up. Next weekend is memorial weekend, the house is mostly full, and I think I am guiding on the ocean for at least six straight days. Great to know that our busy season is close at hand! One more week to do a variety of things – staining decks, working on my “secret project” which I will reveal soon, and then, I have the most difficult job of finding where the fish are (haha). 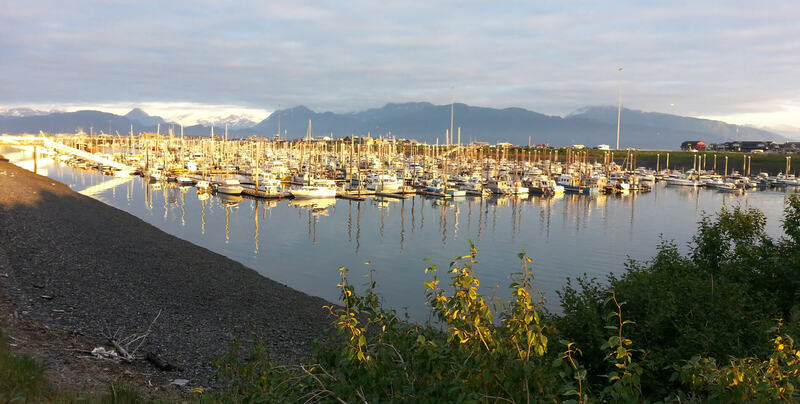 Yes, I need to get out and locate some Halibut, Salmon and Maria’s favorite – the Rockfish, if at all possible. If you are a regular reader of my blog (Sorry, a few have remarked “where have you been? ), sometimes I get busy, and working so hard – I am completely exhausted at the end of the day, with literally no brain power or physical energy to think or type. What I need to do is get up earlier, but sleepy time around here is precious in the busy season. We will see how it goes! While I wait for the puffin photos from Kate and Randy, enjoy this photo Maria took with her cell phone on our “date night” last week. 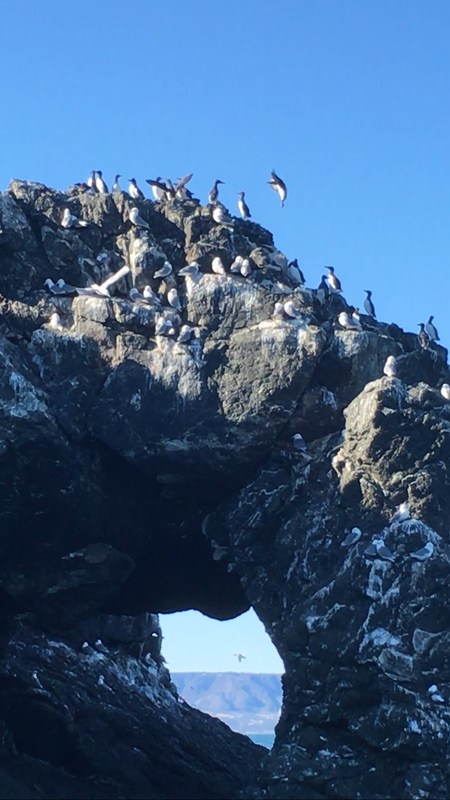 The photo is of the arch-way on Gull Island Bird Sanctuary where there are thousands of sea birds; this is where we spotted the tufted puffins. Stay tuned!